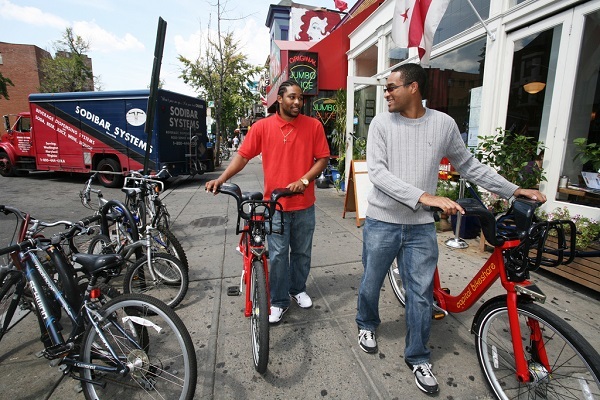 Source: DDOT DC via Flickr. The U.S. capital city has an important role in the modern history of biking: In 2010, it launched the country’s first major bike-sharing service and one of the nation’s first efforts to build protected bike lanes. Since then, bike counts have shown Washington, D.C., quickly become one of the nation’s leading cities for bike transportation. But in this ethnically and economically diverse town, an important question has remained: Have all residents benefited from these public investments? A round of finely detailed, long-term Census estimates released this month offer a close look at that question. There’s good news and bad news. The good news: Among white people, African-Americans and Latinos, D.C. bike commuting seems to be up by approximately one-half or more since the programs began — eight times the nationwide rate of change. The same is true among both U.S. natives and immigrants. It’s true among people in poverty, people on the edge of poverty and people well outside poverty. The bad news: Those investments haven’t been able to correct the city’s existing inequities. Though thousands of Washingtonians of color obviously do bike for fun or transportation, overall bike-commuting rates seem to remain far lower among Black people and Latinos than in other groups. Photo: DDOT DC via Flickr. Based on a comparison of estimates from the American Community Survey 2012-2016 and 2006-2010 data, bicycling rates as a means of getting to work are up across a multitude of demographics. When measuring commuting habits for all demographics except gender, the ACS uses the category “taxi, motorcycle, bicycle, or other means.” Lumping in “taxi,” “motorcycle,” and “other” along with bicycles makes it harder to draw specific conclusions, especially given the rise of ridesharing during the same time period. 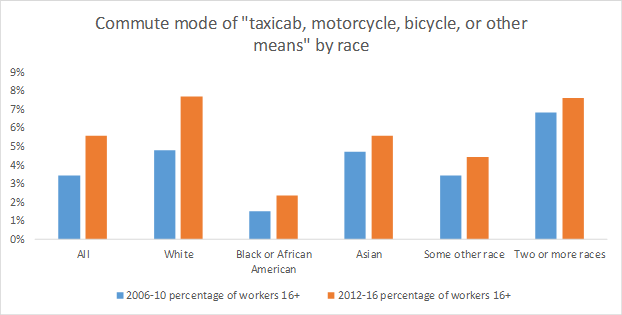 However, when looking at the full universe of 16+ D.C. workers, the category “taxi/other” actually fell from 54 percent to 31 percent of the bike/taxi/other overall total. Meanwhile, the citywide share of bicycling commuters went up. So it’s a fairly safe bet that biking is predominately responsible for the increases shown below. 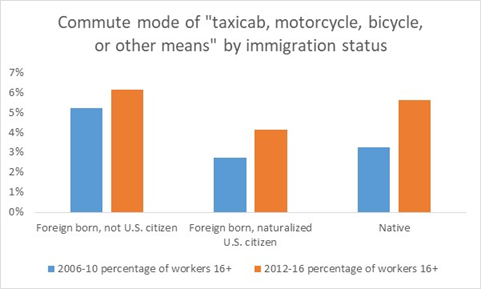 Commuting by “taxicab, motorcycle, bicycle, or other means” was up among all demographics we looked at, and the difference in growth was particularly pronounced among white respondents (61 percent increase) and black respondents (57 percent increase). We specifically examined demographics where the margins of error didn’t dwarf the data itself, which is why these charts exclude the “American Indian and Alaska Native” and “Native Hawaiian and other Pacific Islander” subgroups. Source: 2006-2010 American Community Survey 5-Year Estimates and 2012-2016 American Community Survey 5-Year Estimates. 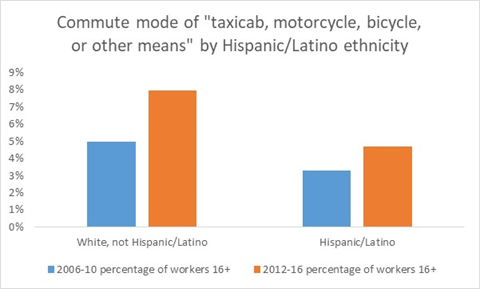 Bike commuting was also up by 42 percent among those who identified as Hispanic and/or Latino. Increases held for all categories of immigration status measured by the Census, though the group that was biking the most in 2006-2010 (non-citizen immigrants) has changed less drastically. 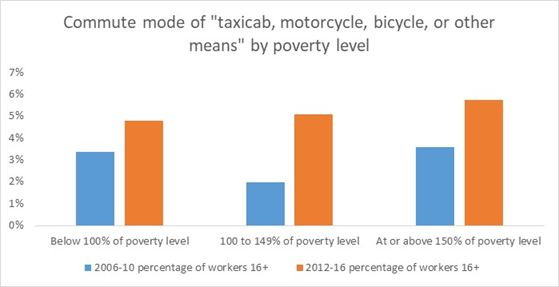 Interestingly, commuting by “taxicab, motorcycle, bicycle, or other means” rose fastest in the demographic at 100 to 149 percent of the federal poverty level (a 158 percent increase), suggesting that these modes are of particular use for lower- to mid-income individuals. It’s important to note that many believe Census data actually undercounts the total number of people who bicycle. One reason for this is that people might used mixed transportation modes to get to work, such as bicycling to a bus stop, or walking to a bike share station. Another caveat: Many people prefer to bicycle (with shared bikes or their own bikes) for recreation and fitness, rather than as a means of getting to work. Or a bike might be used to run an errand, but not to reach work or to come home at the end of the day. None of those trips are captured by these Census numbers. How could Capital Bikeshare, whose annual members are only about 4 percent Black, be part of a rise in biking among Black Washingtonians? One possibility, of course, is that it wasn’t. The broad-based rise in biking in D.C. might be due to other factors such as infrastructure, shifting public attitudes or information, or the price of gas and parking. But it’s also possible that some benefits of bike sharing are indirect. A public bike system might have made biking more politically visible, helping persuade politicians, businesses and the public that other biking investments are a good idea. It might have made bikes literally more visible, making people more aware of all bikes while they’re driving. It might have simply exposed more people to the basic idea that biking can be a good way to get around a city. Whatever the case is, no one questions that D.C. had the nation’s first large and successful bike sharing system. And no one questions that its increases in biking since that launch have been among the nation’s biggest. While the data makes it hard to get into specifics, the numbers we have seem to show that a promising trend is underway for a greener, healthier D.C. transportation future.